Dive at your own pace and time limits. We pride ourselves on treating you like the certified SCUBA diver you are. If your experience level dictates that you would feel more comfortable with a Dive Guide, just ask and we will be more than happy to arrange one for you. We offer Scuba Diving tours and packages for Scuba Divers of all ages and levels of experience! Due to our proximity to the Gulf Stream, you will find exceptional diving that rivals the Caribbean and the Florida Keys. This constant flow of water delivers large schools of fish and other large animals such as porpus,turtles,mantas, and sometimes whale sharks! 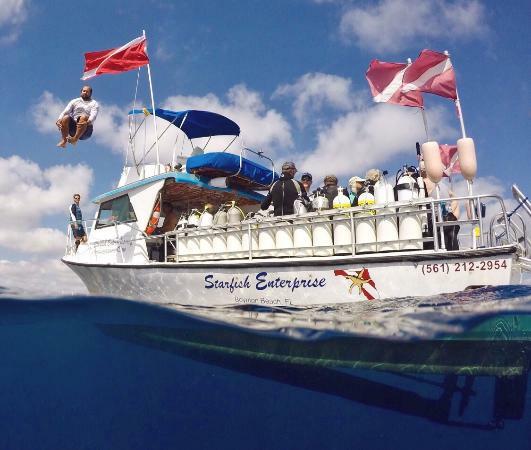 Wreck Diving at its best is only 30 min from our dock in Boynton Beach, Florida. Hosting wrecks in depths anywhere from 80 to 100 ft you are sure to find one that suits your fancy. Keep your eyes peeled for our resident Goliath Groupers they are as friendly as puppy dogs. The 2-Tank Dive ticket is sold out. You can try another ticket or another date.